Amaranth cannot tolerate cold temperatures. Mix a light application of a balanced organic fertilizer into the soil prior to planting. In early summer, drench plants with a high-nitrogen liquid fertilizer to support vigorous growth. Sunflower, Zinnia, Cleome and Nicotiana. Amaranth can grow to 6 feet (1.8m) tall, so it will dominate a group planting. Smaller varieties can be grown in large tubs. Plant amaranth in late spring or early summer, after the last frost has passed and the soil is warm. You can get an early start by growing seedlings indoors in late spring. 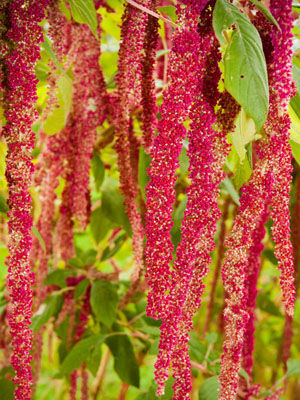 Amaranth varieties that grow head high require 24 inches (60 cm) between plants. The young leaves of most ornamental amaranth varieties can be picked and eaten as cooked greens. Tall varieties that produce large seed heads benefit from staking. Colors include dark red, orange and buff yellow. Gather seed heads for fresh flower arrangements at any stage of maturity. Harvest seed heads for drying after most of the flowers have faded and the cluster feels firm. Hang up in a dry, well-ventilated place. Night-flying beetles and other insects often chew holes in amaranth leaves, but the damage is mostly cosmetic.